In an interview with Rolling Stone magazine in 1994, Steve Jobs said, “The problem is, in hardware, you can’t build a computer that’s twice as good as anyone else’s anymore. Too many people know how to do it.” That statement was made at a time when hardware was still the main focus, but it never rang truer than in today’s cloud scenario. With all the major cloud giants sporting top-of-the-line hardware that’s often made by the same manufacturer in China, how do you distinguish yourself from the crowd? The answer is with better software, and that’s exactly what Microsoft is becoming all about, especially with a slew of recent Azure updates. Fast-forward to today, and after the whole world has rebelled against Microsoft, the corporate giant made the necessary adjustments. Azure is now a cloud service that 90 percent of the Fortune 500 companies trust. As the cloud wars shift away from price tags and hardware configurations, Azure is emerging as the easiest vendor to negotiate with, obviously because of Microsoft’s 42-year stint in enterprise software. That’s also probably why it has an AI division with over 5,000 scientists and engineers and machine learning at the center of a lot of new major announcements. 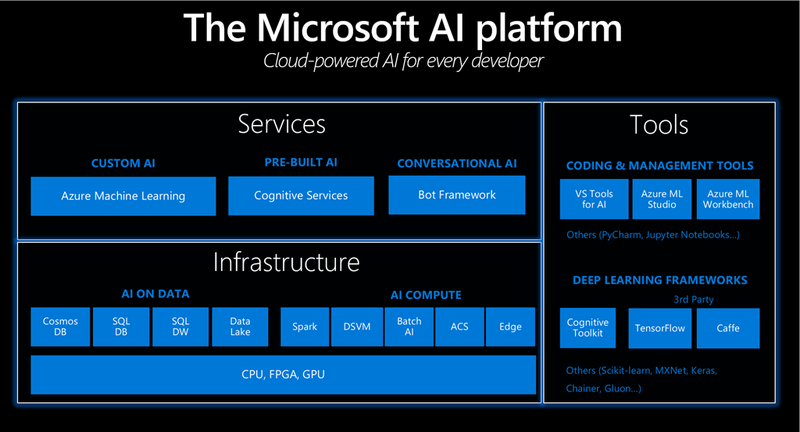 A number of updates have been made to Microsoft’s Cognitive Services, which provide pre-built APIs for developers. This includes a Text Analytics service that extracts key phrases, language, and even sentiment from a document. Additionally, data scientists will have access to some major upgrades on Azure Machine Learning, a service that helps companies develop and run machine learning models. A Machine Learning Workbench feature has also been introduced to make managing machine learning models easier, and developers will be able to export a production-ready model directly to Docker. 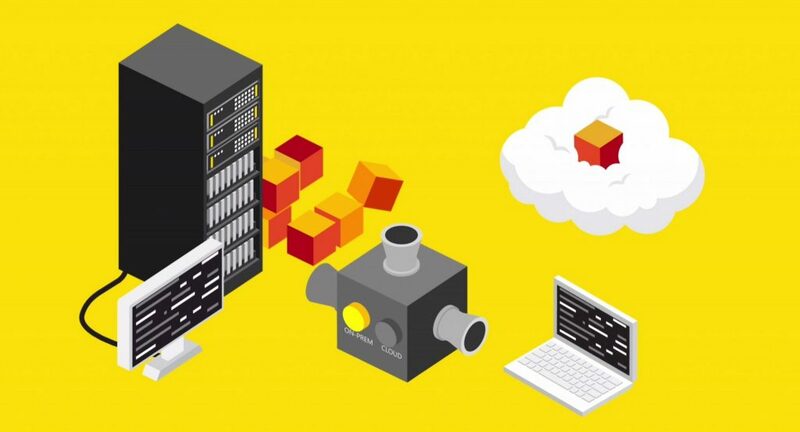 The enterprise prefers the hybrid cloud and Azure Stack brings your on-premises datacenter up to Azure cloud standards even before you get there. Additionally, it lets you use the same APIs to build and manage instances across your hybrid setup. Another major announcement was that Azure Stack appliances are available from Dell EMC, HPE, and Lenovo. 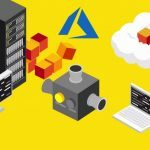 Azure Stack appliances can be compared to buying your own private computer that works exactly like and syncs with Azure Cloud. It is a great way for companies to slowly start making the transition to the cloud. Logs are becoming increasingly important when managing containers, and microservices architecture administrators can now use log analytics to discover threats using a set of prebuilt operations that dig a bit deeper than the typical anti-malware software. A good example is the fact that this feature can query the processor time of all the virtual machines in a specific subscription over a period of seven days. It can also group them node-wise and display a time chart that highlights spikes or anomalies over those seven days. More significant announcements were the addition of PowerShell, change tracking, update management, and simplified disaster recovery to the Azure portal. If you know how to use it right, the command line can be a powerful thing. PowerShell basically lets users perform complicated tasks with single lines of code. PowerShell is now built into the Azure portal, which aims at making it easier to create virtual machines on Azure Cloud. This means PowerShell from Azure is browser-based and can even run on your phone. Change Tracking is the process of keeping track of every single change on a VM, and this feature lets you scan either a single machine or an entire environment for all changes in a given time frame. Update Management is similar in the sense that instead of keeping track of changes, it shows you what updates or patches have been installed (or are awaiting installation). It also gives users a description of the update so they can choose whether they need to be actioned or not. Not surprising anymore is the fact that these features will work across Windows and Linux machines in the cloud or on-premises. Another of the Azure updates was Disaster Recovery. After a disaster, an organization’s reputation hangs in the balance as the whole world sometimes watches with a close eye how it recovers. The new feature not only lets administrators backup their infrastructure but also lets them test it by actually showing them how a disaster scenario will play through. Microsoft didn’t fail to highlight the fact that this feature can be used to build a recovery plan across many different machines in a hybrid environment, making it especially useful for modern infrastructure. New Custom Search and Bing Search APIs were also announced. Reserved VM Instances was definitely a reply to AWS billing by the second. This feature will provide customers with discounts of up to 72 percent compared to on-demand pricing. The trade-off is that customers have to commit to a time period between one year and three years with the option to cancel and get a refund at any time. It already sounds a bit too good to be true, but just to sweeten the deal, users that incorporate Azure Hybrid Use Benefit to transfer Windows Server licenses to Azure get an even bigger discount. Microsoft isn’t forgetting about its government customers either and announced quite a few new Azure updates at its Government Cloud Forum. Privacy is of top concern when dealing with government-related data, and a new service called Azure Government Secret will allow agencies to take advantage of Azure services even while handling classified data under strict protocols. This service builds on the announcement earlier this year that Azure was cleared to serve agencies at Impact Level 5 of the Defense Information System Agency’s cloud security requirements, the second-highest level of classification. Blockchain is a technology that the success of bitcoin has made exceptionally popular. It uses a shared ledger to conduct secure Internet transactions instead of an actual database, sort of like a p2p version of a payment portal. Microsoft revealed plans to make a version of its blockchain technology available for government agencies to use, which is a response to several agencies expressing interest. The U.S. Department of State, in particular, expressed interest to use it to aid recovery efforts around the world. Unlike Steve Jobs’ reference to a Microsoft being unable to catch up with Apple in 1994, the new Microsoft under Satya Nadella is anything but stagnating. It’s also back to doing what it does best — making enterprise-level software really well. There are a lot of company heads vowing to knock AWS off the top of the heap, but unlike Google, which is dabbling in everything from satellites to space stations, Microsoft — as shown by all the recent Azure updates — is focused on software. And that might just be what makes the difference.